Grilled Eggplant Rolls with Cream Cheese and Herbed Millet | Naturally.Grilled Eggplant Rolls with Cream Cheese and Herbed Millet | Naturally. Preheat grill or grill pan. 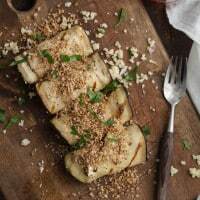 Brush eggplant with olive oil and grill until tender, 2-3 minutes per side. Remove from heat and let cool slightly. In a bowl, whip together cream cheese and honey. In a separate bowl, combine millet with herbs, red onion, olive oil, salt, and pepper. To assemble eggplant, smear 1/4 of the cream cheese on one side and scoop out 1/4 of the millet and press down onto the cream cheese. Roll eggplant and place on a plate. Repeat with remaining ingredients. If using bread, pulse bread in a food processor until in crumb sized and add in olive oil, pulsing a few more times. Sprinkle over eggplant and serve.